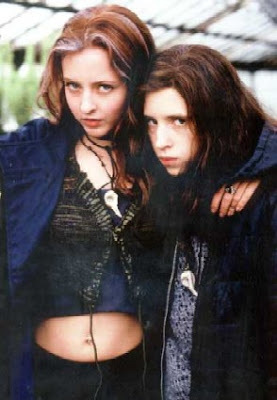 thursday night i was talking to my pals and we somehow got on the topic of Ginger Snaps, the excellent 2000 horror movie about werewolves, a girl named Ginger (Katherine Isabelle) and her sister Brigitte (Emily Perkins). (It’s an awesome movie; there’s a less awesome sequel and prequel too.) Some of the people who worked on the film had worked with my sister on another movie (Jerry & Tom) and when, at the last minute, the Ginger Snaps folks needed someone to play a girl in a 1970s cheesy werewolf horror movie (Ginger and Brigitte rent it to understand what the eff is going on), my phone rang! They told me I wouldn’t have much to do, a couple of lines, and I’d scream when the werewolf attacked me. Not being an actress at all, at all, at all, I was super nervous. I remember getting ready to go to set, being in the shower trying out my scream — “Ah.” — it was totally lame. Anyway, they dolled me up with bad 70s hair & makeup & a skanky outfit. My character was hanging out with a priest (who had a shotgun) wandering the werewolf-infested neighbourhood at night. My line? “Oh Father, I’m so scared.” Thankfully the movie-within-the-movie is supposed to be cheesy so my bad acting? Totally perfect! But then when the guy with a werewolf head and claws was attacking me I was actually scared and my screaming was way better than in the shower! Scary times having that monster inches from your face! And, after we were done filming, I had to scream just into the boom microphone with everyone — including Katherine Isabelle and Emily Perkins — standing around watching me. Which made me super nervy and scared, again resulting in excellent screaming. In the movie, there’s about 1 second of my mini movie shown (it starts at about 4:45 below), but they sent me a tape of the full thing, which is languishing in VHS somewhere at my mum’s. That was the start, pinnacle, and end of my career as a horror-movie actress. Go out at the top! That’s my philosophy. But we were wondering: whatever happened to Katherine Isabelle? I (accidentally) watched Another Cinderella Story yesterday — the ‘sequel’ to the Hilary Duff movie, but this one stars Selena Gomez as the Cinderella character. And her two evil stepsisters? Katherine Isabelle and Emily Perkins. Hilarious! Whoever cast the Cinderella movie (which was shot in Canada) must have been a fan of the Ginger Snaps series. How fun is it for those two girls to play sisters in FOUR movies? They were superb. my dad likes to say that he has psychic powers. one morning he’ll think of a friend he hasn’t seen in 20 years; that afternoon he’ll run into him on College Street. (he was recently discouraged though, after reading the Wikipedia entry on psychic powers and finding out that scientists have been unable to document it.) Maybes I am psychic too! ZOMG, that is freakin' glorious!! I loved Ginger Snaps when I first saw it, but knowing that's you in the movie just puts it up even higher in my books. You are full of surprises, Ms. Calhoun!